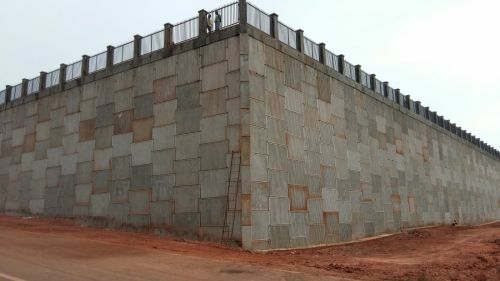 In order to ensure stability, Maccaferri India chose to install the MacRES Reinforced Soil (RS) wall system with concrete panel fascia and ParaWeb soil reinforcement into the Goa Industrial Construction site. Watson Pharma Pvt. Ltd. a global pharmaceutical company proposed to build a full fledged manufacturing unit at Verna, Goa. Verna Industrial Estate is located approximately 10 km north of the South Goa district headquarters Margoa. Modifying soil slope angles beyond their natural angle of repose, can lead to slope instability. This situation can arise when cutting back slopes to install a new highway, or to gain development area on a sloping site. Hence, the contractor had to find a solution that both levelled the foundation while ensuring its stability. After rigorous analysis, the construction team decided that the future factory would require a very firm foundation located at a certain ground level. This decision was determined because the geometry in the particular area has many undulations. Thus the contractor decided to raise the foundation level to a certain height so as to compensate for the cutting and filling part of construction. For the filling part, Watson Pharma proposed to construct a boundary retaining wall for the site. Given the clients wishes, Maccaferri proposed to create the boundary retaining wall out of a Reinforced Soil (RS) wall system with concrete panels and Paraweb as fascia. This particular solution was chosen as it has several technical and commercial advantages over conventional retaining walls. RS wall with concrete panel fascia and Paraweb as reinforcement is a very commonly adopted system that is used especially in the highway and road sectors. ParaWeb strips are planar structures consisting of a core of high tenacity polyester yarn tendons encased in a polyethylene sheath. The strips are suitable for reinforcement applications in combination with concrete wall facing panels. ParaWeb strips are also amongst the most tried and tested geostrips in the world offering 120 year design life and high performance. The incredibly tough polyethylene sheath is resistance to physical, chemical and biological conditions found in reinforced soil structures. Murrum soil—available at the site—was used as backfill material in RS wall. This removed the need to import other structural fills, as can be required with other reinforced soil systems. This not only reduced the costs of the installation, but also the carbon footprint as a reduction of the transportation and quarrying of imported materials. The key feature of this project is the speed of construction: just four months. Only four months were required for the construction of the foundation base made from Reinforced Soil. Maccaferri’s reinforced soil solution is an efficient product that is useful in all sectors including the roads and transport sectors. This case study exemplifies how RS wall’s can be utilized in the industrial sector and more specific, for industrial applications. Most importantly, the solution can be quickly installed and it is highly adaptable as it calls for the use of on-site fill which leads to significant cost savings.